The Human Voice: The causes of vocal cord injuries. What does it take to keep your voice healthy and intact? The human voice is a very intricate, fragile and delicate “instrument” and has to be treated with care. In fact, it is quite easy to damage the vocal box and vocal cords in particular. Some people who are just regular speakers do not even suspect that, at some point, something drastic might happen to their voice. Usually, in their nature, these individuals may be very loud, flamboyant and sometimes (even to a agree) obnoxious. They do not realize that they are stretching those sensitive vocal cords out of proportion on an everyday basis; therefore increasing the risk of a potential vocal cord(s) injury. And if (on top of it) these people are not exactly living healthy lifestyles, they, nevertheless, will be very prone to vocal cord injuries. In some cases, the vocal cords become so stretched that the vocal gap occurs and because of that, the sound of the voice becomes breathy and hissy. Similarly, the vocal gap (known as sulcus vocalis) produces the same effect, as the vocal folds now are delayed in their movement. That’s where you hear the hiss in the voice. You can also compare it to a piece of elastic stretched out of proportion: If the latter is stretched out of proportion quite a few times, it loses its elasticity; thus it will be unable to come back to its original form. If you, for example, could visualize a ‘Cartier Watch’ (with a world-known precise time mechanism) suddenly showing the time in Europe instead of North America, the actual watch will then lose its value, as obviously the mechanism within the watch has malfunctioned; thus the value of the watch will become significantly diminished. This is just to name a few… &, in this case, a more serious vocal injury can occur. Given the above, avoid the vocal damage at all costs, as some occurrences of injured vocal cords may become irreversible. Treatment For The Above Vocal Cord Injuries. 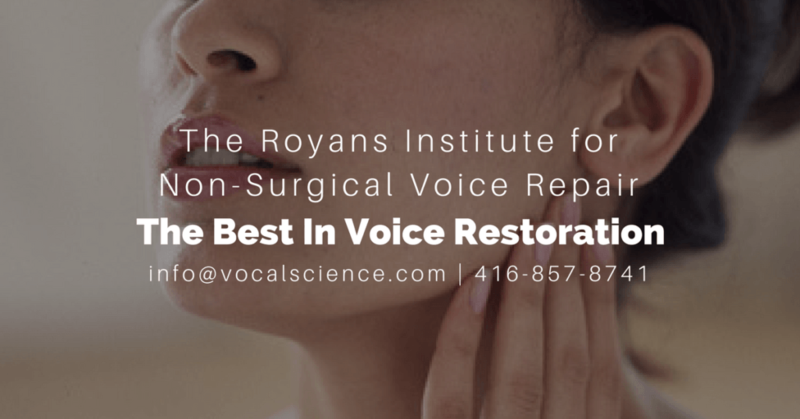 The Royans Institute for Non-Surgical Voice Repair offers a unique and powerful method that facilitates the restoration of the voice and also allows the vocal anatomy to heal via the application of carefully-selected herbs and remedies. By utilizing both proper masterclass voice/vocal instruction and the application of natural remedies, we have great success in non-surgical treatments for damaged vocal cords, as well as for vocal nodes, nodules, cysts, lesions, polyps and many other common symptoms that can cause voice/vocal disorders. Our approach to dealing with such problems is non-surgical, unique and revolutionary.